Erol Montez & Ryan Sauvage, Mike Foyle & ReFeel, Jesse Voorn, Klauss Goulart & Mark Sixma, Orjan Nilsen and more. Ferry Corsten will perform at Electrocity Festival in Poland on 14.08.2013. He will be hosting the "Run To The Sun pres. Full On" stage alongside Sied van Riel and John O&apos;Callaghan among others. 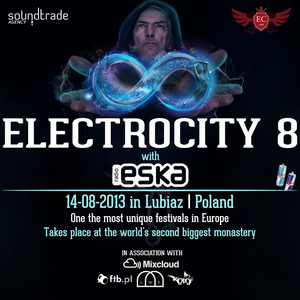 Set in the surroundings of the second world&apos;s biggest Monastery in Lubiaz, Poland; Electrocity is one of Europe’s fasted growing dance music festivals. The combination of historic architecture and cutting edge contemporary music, marries the past with the modern, as thousands of partygoers from across Europe unite at this enchanting location. Line up: The Bloody Beetroots, Dubfire, Sasha, Ferry Corsten pres. Full On, Adam Beyer, Gregor Tresher Live, John O&apos;Callaghan, Sied van Riel, Bobina, Mr. X & Mr. Y, Till von Sein, Carlo Lio, Tigerskin Live, Francesco Diaz, KillSonik, Karol XVII & MB Valence, Nastia plus a lot more!